Be creative is my mantra for 2017. That’s me this year. A regular fountain of original ideas. But it’s tough to be creative when one is preparing paperwork to have the taxes done or packing, say, every single thing you own. Paperwork and packing are boring. But I’m sneaking in a little originality when I can. So today, I’m cleaning out the pantry. (Any good native of Minnesota starts every story with “so”). Anyway, I’m cleaning out the pantry, and I find a plethora of pasta. I didn’t exactly “find” it. I knew it was there, haunting me in my dreams. I’ve tried to think up ways to eat it up, but there was just so much. Or more precisely, so many. Lots of packages, mostly half empty (or half full, depending on your perspective on the world). Lasagna noodles, soba noodles, egg noodles. Rotini, cavatelli, gemelli, fusilli, elbow macaroni, skinny elbow macaroni, spaghetti, angel hair spaghetti, quinoa spaghetti, supergrain spaghetti, multi-grain spaghetti, ready-cut spaghetti. And stelline (for your chicken and stars soup, you know). Yes, I know. Please don’t heap any more guilt on me. Why did I buy so much? Why haven’t we eaten it? Why did I keep it? So I came up with an ingenious way to get rid of it without just throwing it away. Do kids today still do macaroni art? I’ve got 17 opened boxes and bags of various kinds of pasta that would work for a daycare or preschool. Yes, 17 — don’t judge. I can’t give away to the food pantry because it’s open, but the waste of dumping seems extravagant. FREE — all you’ve got to do it pick it up. Anyone interested? This is me. Looking at you. Hey, it worked! Someone’s coming for my leftover pasta on Monday. I’m redesigning my Beloved’s business website, and he needed a new logo. I had no real idea of what I wanted — just the words — so I hired a woman in the United Kingdom to throw out five ideas for five bucks. Five bucks! She came back in 24 hours with five amazingly clever concepts. For a few bucks more, she provided our favorite in color, black-and-white, on a white background, on a transparent background,in high resolution and in low resolution. Now I’m working with a man from Pakistan to program my website design ideas (that’s costing more than five bucks, but that’s OK — I’m willing to spring for the whole kit and kaboodle for a multi-page website). Fiverr is great no matter what kind of service you might need (except a haircut — that might be tough — although you can get full professional beauty consultation for five bucks). Because I hired the logo designer, I earned five bonus bucks in some Fiverr promotion or another, so now I have five bucks to spend. On anything! And I’ve got to do it before March 1. I want to do something fun, but I can’t decide. Maybe my loyal readers can help me figure it out. Should I have someone rewrite my “about the author” blurb? How about a one-week personal workout program? I could have someone cast “an extremely powerful Kabbalah spell.” I could invest in “a rhyming poem, snarky letter, or back-handed hallmark card type comment” worthy of shouting from the rooftops. I could have someone write a message on their lips or in cappuccino froth and take a photo for posterity. Or maybe something even more bizarre and creative. Heck, I could even have someone write a Minnesota Transplant blog post for me! What do you think? How should I spend my fiver? Congratulations to me! Today is the seventh anniversary of writing a blog. I posted my first entry exactly seven years ago today when I wrote rather plainly about a visit from Mom and Dad and the end of autumn. 1. Think hard about your brand before you begin. I spent a lot of time in the month before beginning my blog settling on a name. I finally went with the blog title you’ve come to love because I thought it vague enough to permit me to write about a lot of topics, yet specific enough to describe my world view. And thus was born Minnesota Transplant. I haven’t gotten rich in seven years, at least not in terms of financial windfall. But like a true writer, I can’t not write. I am compelled to create. And this is the forum in which I can be creative. The purpose of my blog, first and foremost, is to record my daily doings for the people I love who now live two states away, primarily my parents and sister. Writing a post is a little like writing a letter, and I know my long-distance family gauges my well-being by what I post. Fortunately for me and my ego, a lot of other friends and acquaintances have found a place in my audience, too (see those stats over there in my sidebar? 1,813 followers and 127,318 hits and counting to be precise). 3. Playing small ball pays off. Eventually. In seven years, I’ve written 1,845 posts here. Plus, I wrote 116 posts on Monica Lee, my author and writing blog, and another 116 entries on Clickago Storywerks, the blog about my photo organizing business (not subscribing to those? get thee over there to remedy that situation). On average, that’s 299 posts a year, or nearly six posts a week. Pretty impressive. At least to me. In order to write that kind of volume, I subscribe to the motto “Showing up is 90% of success.” I know that not every post is stellar literary fodder. But once a week or so, I write something really great, and I do that by trying to write something really great every day. This is a personal blog, not a business blog, so this lesson definitely doesn’t apply to you money-makers out there. But one rule I break every day is staying on point. I write about literally everything from books to fitness and recipes to aging. Even when I participate in WordPress’s weekly photo challenges, I write a lot of words to go along with my photography. Because I can. I’m in charge, and I enjoy thinking outside the box. And that freedom is what keeps me coming back to the keyboard. 5. There’s no accounting for taste. I’ve written some amazing bits in seven years — stuff I love for the writing and the meaning. But my popular posts have been a book review of In Sheep’s Clothing: Understanding and Dealing with Manipulative People, a recipe for Who Hash and an analysis of what teachers are paid at my stepson’s high school. Apparently, those posts have answered big questions for people living with covertly aggressive people, cooks who are also fans of Dr. Seuss and taxpayers (or possibly student teachers). I know some angry bloggers might get a lot of attention, but I don’t need any more meanies in my life. Early on, I posted something depressing and pissy. My father encouraged me to rethink that attitude. The world is filled with enough pissiness without me adding to it. So when I’m angry, at least I try to be clever. 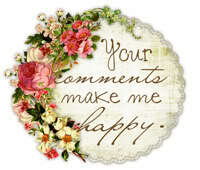 But most of the time I try to count my blessings, and an attitude of graditude makes my blog — and my life — richer. If there’s one life change I’d like to experience from writing my blog, it’s a book deal (I mean, who wouldn’t? ), but I’ve already gotten a gift. The very act of thinking about a topic cements it into my memory banks. I rarely feel like time is slipping through my fingers. Like a diary or journal, I can look back on blog posts and remember small events in my life. And that’s what life is made up of: Small things. 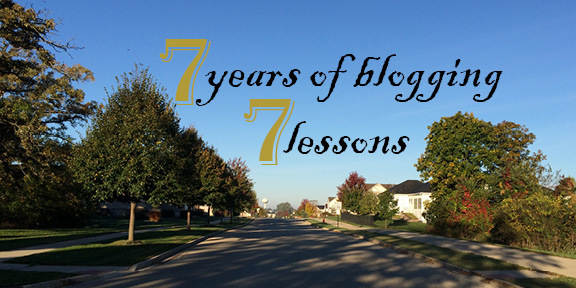 So, there you go … seven years of blogging, seven lessons. And today marks the beginning of another seven years. Yay, me.